Disclaimer: I’m not a lawyer. If you’re working with legal documents, please stop reading now, and go read some Supreme Court rulings instead. I know, I know: “Huh? Isn’t your content writer supposed to have good grammar?” Yes. But that’s not who I’m talking about. I’m talking about the writers you want to smack because they’ll argue for 20 minutes over a comma. I should know — I used to be one of them. I was the type who had to be restrained from stopping a print run because of an extra space after a period. 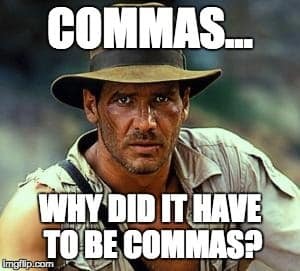 And I don’t even want to think about how much all of those comma debates cost in terms of time and resources. If you’re not a writer, try imagining how mortified you’d be if you made a really stupid mistake in an area where you’re supposed to be an expert. It would be like Martha Stewart forgetting to turn the oven on. I know writers who would take an experience like that to their graves. In the business world, though, you have to weigh the value of perfect content against the time and resources you’re putting into it. I’m not saying things like grammar and punctuation aren’t important. They are. But if you keep finding yourself sitting on your hands so you don’t strangle your writer while yelling, “Who the hell cares?”, you and your writer need to have a heart-to-heart. And that conversation needs to start with you reminding the writer that the objective isn’t getting an A+ and a smiley face stamp. The objective is to accomplish a business goal. And if the resources you’re putting into debates over minor details outweigh the value of the content itself…well, that’s an F, not an A+. What do you want them to do, think, or feel after reading this? Giving the writer that information on the front end provides a clear goal for the content — something other than perfection. Bottom line: If you’re doing tons of revisions to correct “errors” that nobody but another grammarian would notice or care about, that’s probably not a good use of resources. The hard part will be convincing the writer. And be gentle: The fact that not everyone has a firm opinion on the Oxford comma is a hard truth for a writer to accept. So be prepared for a slow progression through the various stages of grief. But, if you start with the three pieces of information listed above, you’ll eventually get there. PreviousLet’s get real: Content marketing is about business. © 2019, Podnar Consulting, LLC. All rights reserved.